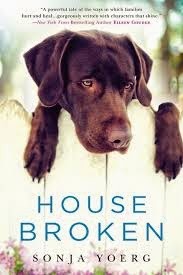 House Broken is the first book I finished in 2015 and it was a great choice. While I was reading, I was reminded of just how much I enjoy women's fiction...uncovering the secrets of a family often reveals the reasons why families work the way they do and it's always interesting to examine and explore these dynamics. I especially enjoyed this one because as I mentioned...dogs! The main characters, Geneva, is a vet so there are a little doggie anecdotes throughout the book. This also provides an interesting contrast to the human characters as they care for dogs, relate to them, and deal with their needs in their lives. So as I mentioned, Geneva is the main character (though her daughter and mother also get POV) and her mother has just had an accident. Further complications require her mother to come live with Geneva's family as she recovers, giving them all a chance to reflect on the past. Geneva and her mother's relationship has always been strained and she also has a sister she's estranged from. She wants answers and as she interacts with her mother more and more, the past begins to come to light. On top of everything else, she's also dealing with her own teenage daughter and her issues. Yoerg gives us glimpses into Ella's mindset (the daughter) and Helen's mindset (the mother). I really enjoyed this book! It was just such a nice read, I don't know how else to explain it. It wasn't irritating, I was never bored--it was a great story, and I just really enjoyed reading it. I also think the way it ends is interesting, it's both hopeful and not hopeful! When you read it, maybe you'll understand what I mean. I received a copy from the publisher for review.